Text is brilliant. You should always bet on text. But interactivity is good too. Here's a series of ideas I find interesting, many of which combine text and interactivity. Many of them are from demos that were never fully realised, confined to the marginalia of history. Some of them became very influential. First the printing press and for this we go back to Johanes Gutenberg. The ability to move letters around, endlessly reconfiguring them, was a key to the rise of the Gutenberg galaxy. Skip a few years, past the garden of forking paths and we find. 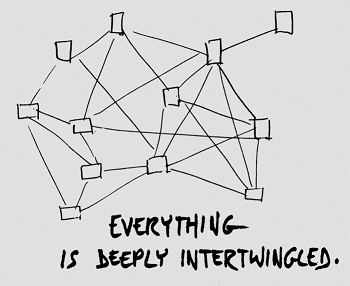 "A mesh of associative trails "
We're unstuck in time. It's 1945, both before and after Hiroshima, and Vanevar Bush publishes As we may think, outlining how collective memory will be available to all in a machine called the Memex. They imagined people blazing and sharing "A mesh of associative trails" through the collective knowledge space. Imagine a guided tour bus. The tour guide gives information, takes you to the sites where you can hop off and have your own experience. The next bus arrives as soon as you want it. The tour guide knows all. We're unstuck in time. It's 1967. It's 1960. Ted Nelson's Project Xanadu is the first hypertext project. The world wide web, that is inspired by it decades later, fails to live up to the goals of Project Xanadu. StretchText is a hypertext feature that has not gained mass adoption in systems like the World Wide Web, but gives more control to the reader in determining what level of detail to read at. It's 1968. We're unstuck in time. Douglas Engelbart gives the mother of all demos. Douglas Engelbart's lifelong mission is to raise the collective intelligence of humanity. I struggled to lose a few kilos. Doug's lifting all of us up. It's 1951, we're unstuck in time. Yesterday, Douglas Engelbart got engaged to his future wife. He decides to think about his career goals. He decides he wants to do something important to help the world to work together on complex urgent problems. We need to get much better on an exponential scale. Computers can help maybe? It's 2018... we still have complex urgent problems. It's 1961. Doug's techniques amount to what he calls Intelligence Augmentation. In the way that a hammer extends and augments the leverage and power of the human arm, our tools should extend and augment the intelligence of our minds. The mouse and hypermedia are here to stay, but many ideas from Engelbart remain "unrealised" today. Have you noticed the problem with the mouse is that you have to keep switching between mouse and keyboard? So much so that some people avoid using a mouse altogether and just get really good at using keyboard shortcuts and other wizardy. It has just five keys, but combinations of keys (like chords on a piano) would produce different letters. Read more about it, including Doug's teaching method. It's the profile of the inventor of Copy and Paste, Larry Tesler, who worked with Tim Mott on the first implementation of Copy and Paste. Their work has been copied (and pasted?) many times since. I just had to add hypertext, (by subclassing the Text object). 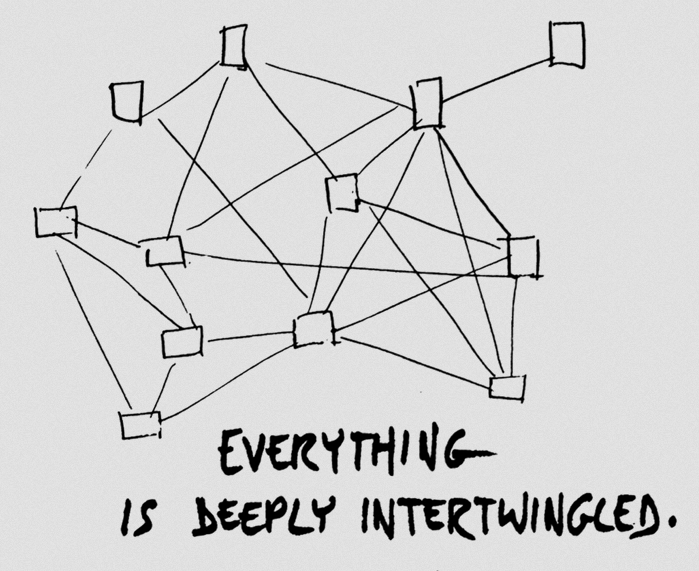 Ward Cunningham and others were discovering patterns everywhere they looked in programming. They couldn't record them quickly enough, so Ward made the Wiki Wiki: from an hawaiian word for Quick. It was a minimal addition to plain text that created new links to new pages any time the author joinedWordsTogether. There's magic in Ward's innovation. Two or more words, if brought into contact with each other, would emit a burst of energy: a new concept would be formed and the power of their union would tear a wormhole through space, leading to a new page. The other great innovation was that he let everyone edit. No permission model at all. You can read, you can edit. It was easy for other people to see what had been changed and to revert any vandalism. It's the "forgiveness over permission" model, espoused by Grace Hopper. People poured many many words into that Wiki Wiki. It was in the era when the internet truly was "words plus enthusiasm"
One of the inspirations for Wiki Wiki was HyperCard: a pre-WWW technology that let you build a personal information system in a dynamic and programmable way. There was considerable HyperCard Mania!. It was a time when the Citizen Programmer seemed to be the way computers were headed. Other personal information systems also had innovative ideas and passionate fanbases. 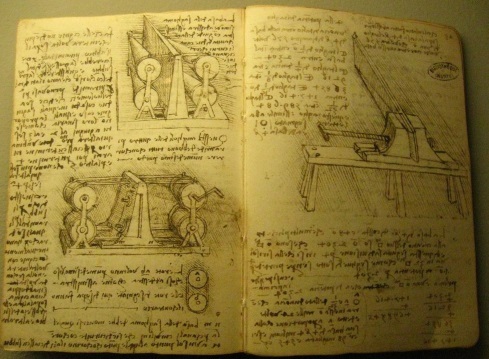 There are many great note taking systems throughout history, such as Cornell, shorthand, concept mapping, SQ3R and sketch notes (more on sketchnotes). When studying physics in highschool, and particularly when studying engineering, we were encouraged to keep a Scientific Journal or Scientist's Notebook. No wait, that was one of Leonardo Da Vinci's notebooks. In architecture and programming we talk of "patterns" and the wiki was invented to captured their myriad forms. A different but very similar concept from the creative arts is the idea of "Tropes" and in particular the "TV Tropes" website. Patterns and tropes are synonyms. The big list of rpg plots is also the kind of problem wikis were made to solve, as is The Top 100 Things I'd Do If I Ever Became An Evil Overlord -- though wiki's are great for lists, they tend more toward sprawling networks of information. if everything is addressable you need a kind of scheme or protocol for identifying things. in Hyperscope, every element is automatically numbered. Easier than asking the author to name each thing. See this video also: Screencast of Douglas Engelbart's HyperScope Project from Brad Neuberg. With markdown libraries they can automatically name every heading for you. Very helpful and takes the onus off the author to decide which parts of a document can be linked to. a reference system with addresses can either return a single thing or a list of things. For example, a primary key only returns one item - or in CSS, a '#ID' selector should only return one element (but this is an unenforced constraint) but other ways of selecting can return many homogenous things, e.g. select * from person where managerid = 1, or many heterogeneous things - $(".item") - elements returned can be of many different types. predicates that are applied to sets to filter them. Dan Bricklin and Bob Frankston invented the spreadsheet. Trilium - Trilium Notes is a hierarchical note taking application with focus on building large personal knowledge bases. Ajax, perhaps the earliest surviving tragedy of Sophocles, presents the downfall and disgrace of a great hero whose suicide leads to his rehabilitation. SCUMM - "Script Creation Utility for Maniac Mansion"
"The revolution hasn't happened yet"
Simultaneous Editing (one person editing multiple things at once, not collaborative editing, where multiple people edit one thing at once), for example "Lapis is an experimental web browser and text editor allowing simultaneous editing of text in multiple selections. Lapis is able to infer the list of selected elements automatically from positive and negative examples given by the user, during a process known as selection guessing, based on concept learning." a light table interface for a multi-page PDF, where I can zoom in/out, annotate the PDF with text, easily mark pages to split into individual pages (or page ranges), add comments to each page [range], then split into individual files.